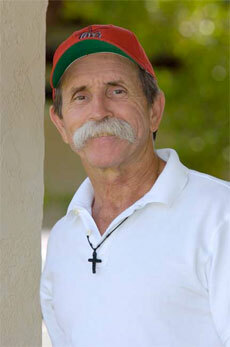 Ocala Farm Ministry's Chaplain Bob is quite a guy. When you encounter him on a farm or at a sale, he's always got time for a chat or a joke, always asks after friends and family, always happy to hang out with the kids. "So?" you ask, "what is so remarkable about that?" What many people may not realize is that Chaplain Bob has one or two other items on his daily agenda. In the past year alone, he has driven approximately 35,000 miles, visiting more than three hundred farms and training centers along he way: he has performed over fifty church services, forty five Bible studies and provided transportation for more than fifty people in need of a ride for various appointments. In addition, he has performed six weddings, ten funerals, four baptisms as well as many other farm related religious services. He has also counseled many in need of advice or guidance, fixed leaky roofs and helped to enroll many kids in public schools. Then there are the many hours he has devoted to the planning and creation of his great dream, the Robert Scanlon Community Center for farm workers and their families. And yet, after all of that , he's still able to do what he does best: give generously of his time and of himself whenever he sees you...Yes, Chaplain Bob is quite a guy and we are very lucky to have him for the Ocala Farm Ministry. Chaplain Bob was born in Mansfield, Ohio in 1946, as a child he spent time in Cuba and Ecuador with his parents who were missionaries. In 1968 he was awarded a Purple Heart in Vietnam. Returning stateside he completed his education at Miami Dade Community College, Florida International University, Florida Bible College and Andersonville Theological Seminary. He is married to Dolores (Dee) Miller has three children and two grandchild.